Shake product well before using. Measure the desired amount of food out and place it into a clean container, such as a small cup or bowl; rinse frozen foods under a stream of (preferably purified) water until they have thawed and any solution in which they were frozen is washed away, then place food into container. 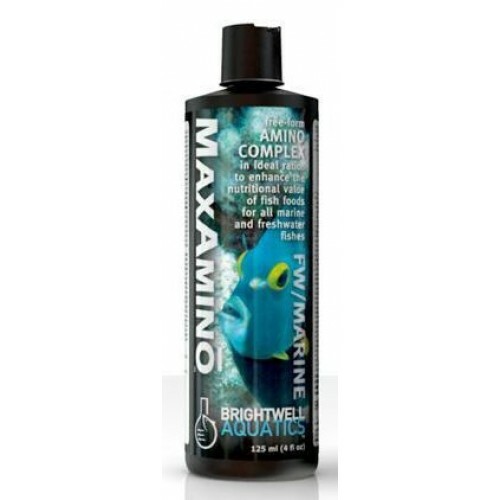 Add MaxAmino drop-by-drop to the container, saturating the food, but do not add so much of the liquid that extra remains; in other words, do not add a capful of the product to a pinch of food and then add the entirety of this to the aquarium. Allow 2 - 5 minutes for MaxAmino to soak into food, then add food to aquarium in an area of moderate water flow away from pump intakes or overflows, or as desired; this is effectively accomplished by scooping the saturated food out of the container with a small spoon and placing it in the desired location inside the aquarium. Discard any unused MaxAmino left over in container. Note: that saturated food has a tendency to sink more quickly than does “dry” food, however it is also easier for fish to consume due to the fact that it is softened and at room temperature (frozen foods). Foods allowed to soak for considerably longer than 5 minutes may easily fall apart when exposed to moderate water flow; this may be of benefit when the aquarium contains species of fish that prefer small food particles to relatively larger ones.